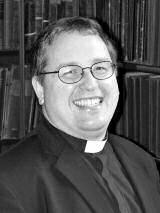 Kelvin Holdsworth is being installed/induced (or whatever it's called) as Rector and Provost of St Mary's Episcopal Cathedral tonight at 7pm. I hope to be in the congregation. He showed up at our 9am Holy Communion service on Sunday (mini-review here. I feel like I am appearing in a Father Ted episode- "He says good mass!". Expect lots of nuns to show up next time.....how disappointed will they be?). Kelvin and I first met up last year. I'd been watching his blogging exploits (for he is the daddy when it comes to Scottish Episcopal blogs), and when the bishops decided to go all controversial, we met up to discuss things. We sat in his dining room in Bridge of Allan for a few hours, and while there was much on which we disagreed, we got on well. While I was there, BBC Newsnight Scotland called to ask if I would go on the programme that night. Me: Who else will you have on? Auntie Beeb: We're trying to get someone else from the Scottish Episcopal Church. Auntie Beeb: Yes. How did you know that? Me: Just a guess. As it happens, I'm sitting with him right now, having a nice a cup of tea. Auntie Beeb: Really? But you don't agree, do you? The man from Auntie was genuinely disappointed and somewhat amazed that we weren't at each other's throats, perhaps because being so would have made for better TV. There's nothing quite like a couple of clergy having a row to spice up the news. As it turned out, he didn't go on the programme, but I'm sure we would have been very civil to one another! Every blessing to Kelvin, as he takes on the role of leading the Cathedral. It's just round the corner from St Silas', so I look forward to lunch with him soon.